Get inked! The Vancouver Tattoo & Culture Show is back for another year with special guest artists and performers. Evilyn13 is back this year to rock all weekend long while you clench your teeth and get some fresh body art. Gidy'up! Are you ready for a weekend of comics and cosplay? 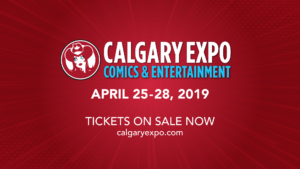 Grab a selfie with Evilyn13 at the Calgary Comics & Entertainment Expo in her booth. Plus, pick up some of her prints and get the signed as a memento of the event! Everything's bigger in Texas! Evilyn is prepared to see if that's true as she attends her first comic convention in Dallas as a cosplay guest. Grab your weekend pass and swing by Evilyn's booth and take a selfie and pick up some signed prints all weekend long! Evilyn enjoyed MegaCon so much last year, that she is coming back for a second helping! Purchase your weekend pass and spend the weekend grabbing selfies and picking up signed prints from your favourite cosplayer. Don't forget to bring your best Pokemon for trading and battles at Evilyn's booth! Vancouver Fetish Weekend is back! It is of the largest gatherings of fetish party people on the west coast featuring international performers, DJs and fashion shows. Grab your VIP weekend pass including the infamous fetish cruise and prepare yourself for a wild weekend of pervy perfection!